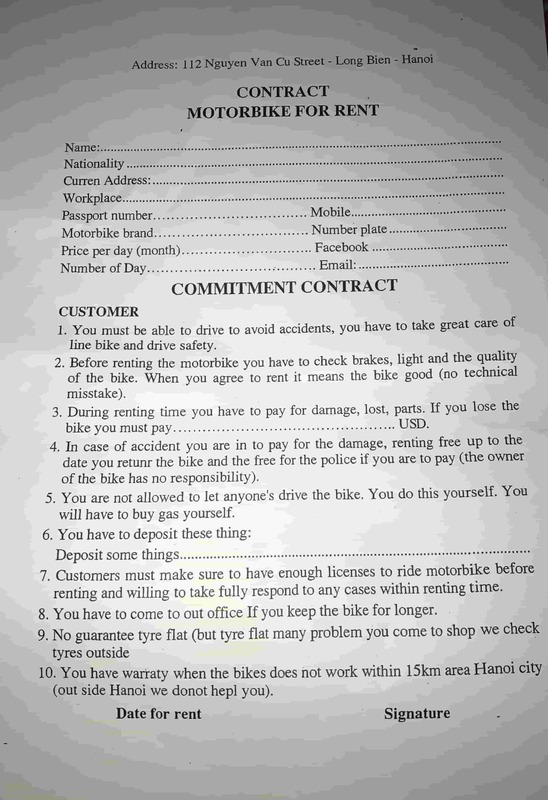 A motorbike rental contract is a type of service contract, a contract between the lessee and the motorcycle lessor to ensure the terms of the agreement are tight, to reach agreement on the price, the best rental period. The customer is responsible for damages to the bike caused through crashes or othe rexternalin cidents . must remember to check the brakes on the bike and we will not accept braking is sues as areas on for the crash. Motorbike Nguyen Tu is not responsible for the drive r’s safety. 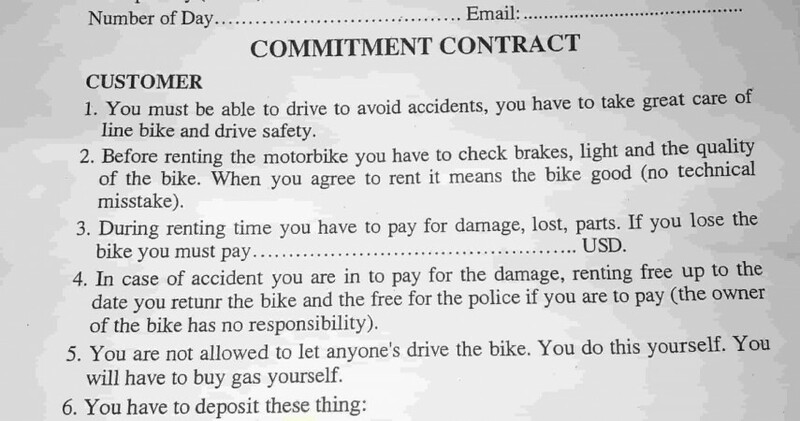 If the bike is damaged beyond repair or stolen the customer must pay the value of the bikes tatedat the start of this contract. Customer must remember to pay the rent a lfee each month. If the customer fails to pay on t i m e Motorbike Nguyen Tu has the right to reclaim the bike . 20-50,000vnd to fix or 80-100,000vnd to replace inner tubes on the road side . parking the motorbike outside of secure parking places then Motorbike Nguyen Tu will help reclaim the motorbike We have the right to cancel the contract and the customer’ s deposit will be return ed! Motorbike Nguyen Tu will maintain and fix a ll elements of the motorbike for free a part from flat tires and fixing/ replacinginner tubes. If the bike does not start and has no electricsitis the custom e r’ s res ponsibility to kick start the bike. Please do not fix the motorbike with back street mechanic sas they steal genuine parts from our bikes . We will not refund customers who at tempt to fix the bike without getting our consent . Customer may change the bike at anytime if the bike has problems . We are relaxed a bout changing bikes and encourage people to do so if they are not happy. Customer has read and signed the contract and agreed to a fixed rental . The fixed rent al price will not change. If the bike stops working out of hours then pleasse park it in as ensible security place such as an apartment complex baseme nt a nd a rra nge a c a l l out within working hours .